After my disappointment with Middlekauff's The Glorious Cause, I was really hoping that Gordon Wood's Empire of Liberty would re-kindle my excitement for the Oxford History series. After all, Wood is one of the most popular and respected writers of the era and Goodreads is filled with five-star raves for his nearly 800-page doorstopper of a book. Thankfully, my hopes were rewarded with an absolutely marvelous volume. Rather than getting bogged down in the minutiae that I felt dragged down The Glorious Cause, Wood's contribution to the series focuses on giving the reader a broad, yet nuanced understanding of the cultural, philosophical, political, economic and religious movements of the time. When Wood does indulge in arcane details, they serve to illuminate characteristics that continue to define America even today. Within the first chapter alone I found myself highlighting passage after passage of wonderfully insightful prose. By modern standards, this declaration and these claims of equal rights smack of hypocrisy, or worse, given the severe unequal status of women, the treatment of the native peoples, and the fact that one-fifth of the American population was enslaved. To be sure, “we should not forget the restrictions placed on rights by eighteenth-century men, but to stop there,” cautions historian Lynn Hunt, “patting ourselves on the back for our own comparative ‘advancement,’ is to miss the point. How did these men, living in societies built on slavery, subordination, and seemingly natural subservience, ever come to imagine men not at all like them and, in some cases, women too as equals? The period covered, 1789-1815, is a fascinating one. From the debates and ratification of the Constitution to the end of the War of 1812, these initial years of the new republic are fraught with factionalism, sensationalist rhetoric, delicate diplomacy and the teetering first steps of a nation striving to be taken seriously on the world stage and fighting for the very survival of the American experiment at home. Much of the fractious fighting of the time came down to various interpretations of the Constitution. Those in the Federalist camp felt that America needed a strong national government and a powerful executive (with the power to raise standing armies and directly tax its citizens), both to tie the nation together as one and to avoid the disparate and competing agendas of a union of mere separate but equal states. They believed in banking and commerce, global trade and manufacturing while their Republican adversaries viewed America as a primarily agricultural, peace-loving nation of yeoman farmers. Good republicans worked the soil, they believed, and provided for their families with the homespun goods they themselves made. Republicans like Jefferson and Madison suspected their anglophilic Federalist compatriots as wanting a return of the monarchy they had just fought to divest themselves of. They aligned themselves with their Jacobin brothers in revolutionary France even as the nation drowned in retribution, violence and bloodshed. Wood highlights Washington Irving's Rip Van Winkle as a sort of parable of the astonishment that most Americans must have felt amidst the vast social, political and economic and changes they were living through. Americans knew they were an experiment, but they were confident they could by their own efforts remake their culture, re-create what they thought and believed. Their Revolution told them that people’s birth did not limit what they might become. Indeed Wood details in a later chapter how Americans' newfound sense of individuality and egalitarianism made it difficult to find good help in shops and homes. Hierarchy be damned, nobody in this new America felt they were beneath anyone else. 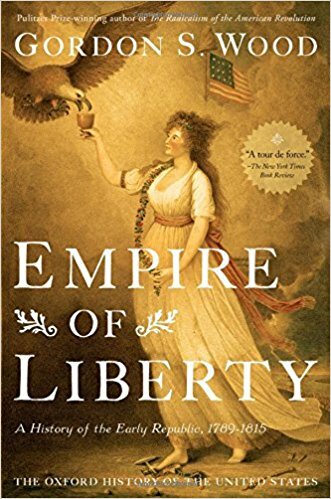 Empire of Liberty isn't a quick read, it took me about a month, and it will occasionally challenge a casual reader, but if one commits themselves to it, they'll be rewarded with a rich, powerful, edifying experience.